The Swedish novelist and journalist, Liza Marklund, has sold more than twelve million books worldwide. So if past sales figures are any indication of future success, her recently translated Red Wolf should do well in a market craving her particular brand of frozen-north setting and mentality. Dogged crime reporter, Annika Bengtzon, is drawn to the Arctic town of Lulea by the promise of new evidence relating to an old, unsolved case of terrorism: the blowing up of a military plane in 1969. When a local journalist working on the story is found murdered, Bengtzon’s instinct is to track down the bombers in the hope of finding his killer. 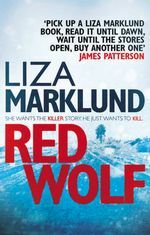 Despite the orders of her boss in Stockholm to leave well alone, Annika realises that both crimes are also related to a series of violent deaths unfolding across northern Sweden. At the centre of the violence, past and present, is the shadowy figure of the Dragon, a code-named assassin who has returned to Sweden to tie up loose ends before his impending death. The race to uncover the Dragon’s identity before he eliminates his former co-conspirators forms the narrative spine of the book. Red Wolf is certainly a page-turner, but does it convince? The author grew up in the Swedish Arctic and successfully conjures up a landscape of dark and dreary despair. There are doubtless autobiographical resonances, too, in Marklund’s evocation of the stresses and politics inherent in Stockholm media life. As to the credibility of the main protagonist, it is harder to judge. Annika’s response to the painful revelations of her private life would seem to add substance to Marklund’s characterisation of the feisty truth-seeker, yet she remains elusive and enigmatic, as much to her husband as to the reader. Those wishing to deepen their acquaintance only have to read the rest of the Bengtzon series or wait for the forthcoming film series.